How Do We Ensure the Next Generation is One Which Communicates Civically, Values Honesty and Recognizes Reality? My school in Kirkkonummi supports the family’s upbringing. Together with the guardians we carry out our school values, which are safety, honesty, responsibility, respect and joy of learning. Our values are in the eye of a storm! In this world we have reached the point where we have to emphasize the meanings of values in our school work .Do the values mean anything anymore if the adults act against general values and procedures? Is it okay to do whatever it takes just to achieve your own goals? Even the USA has a president that claims lies to be true. We hear arguments that something is true because it feels like it! What separates the right news from the wrong one? How do you know if the news are true or false? Schools around the world are now pondering around the basic question. What do we need schools for? The strong common knowledge and the knowledge of history and culture, give us an ability to understand people who think differently from us. When we study foreign languages it gives us the opportunity to follow other countries’ data exchange. The media education has a key position while practicing student’s ability to analyze the data flow and its truthfulness. How prepared are our schools to quickly update our curriculum in this rapidly changing world? Are we alone in this task? In Finland in February from the year 1995 we have had a News week in schools. The News week is an important campaign between schools and the newspapers. – one of the biggest media education event in the whole Finland. During the week the newspaper companies give the contents of their digital papers to schools for free. The teachers can find information and teaching tips from sanomalehtiopetuksessa.fi site. And even invite a reporter to school. 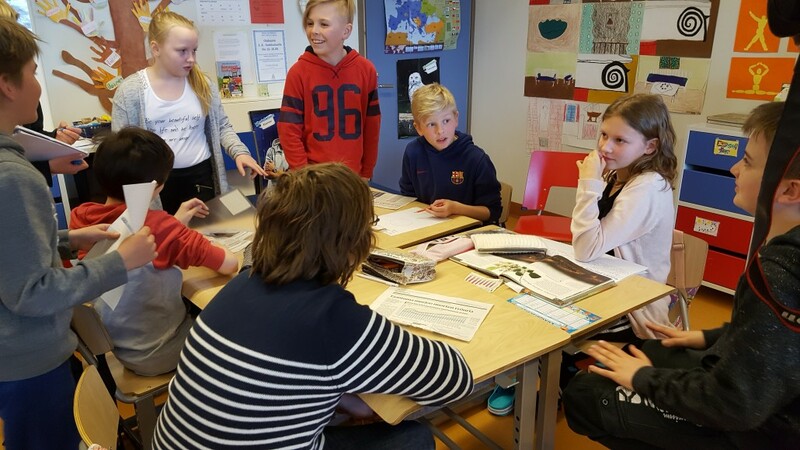 Finnish press companies have made material for all schools (sanomalehtiopetuksessa.fi) to study the reliability of media. We had the News week during 30.1.- 3.2.2017 and the press challenges us to ponder our own media world, what do you believe in the internet and why. The press all over the world is worried about the ability to read media and about transmitting the right knowledge. We have seen earlier how the work of press have been restricted, how the reporters have been threatened even killed. We have seen how the media houses have been taken over so that the new conquers have reached their position. Beside that we are now facing the so called fake news world. It’s natural to gather people around you that think like you, so does children and adults. But if your view of the world is made by your mates’ opinions or just by a few news or publications – there is a danger of a very narrow picture to things. Special groups will be formed, groups that only want one truth. Democracy makes this possible but democracy only works if we accepts others’ opinions and give space to real facts. The task is challenging as well to schools as for private teachers. The co-operation between schools and professional press companies make this possible and in the same time show young people how adults defend democracy. The media education is more important than ever and will probably always be part of school education. As an adult I just hope that the children can remain as children long enough. This adult world can wait! http://marketing.pathstomath.com/wp-content/uploads/2013/04/paths_to_math_logo_340x156.png 0 0 Maarit Rossi http://marketing.pathstomath.com/wp-content/uploads/2013/04/paths_to_math_logo_340x156.png Maarit Rossi2017-02-15 14:51:202017-02-15 14:51:20How Do We Ensure the Next Generation is One Which Communicates Civically, Values Honesty and Recognizes Reality?